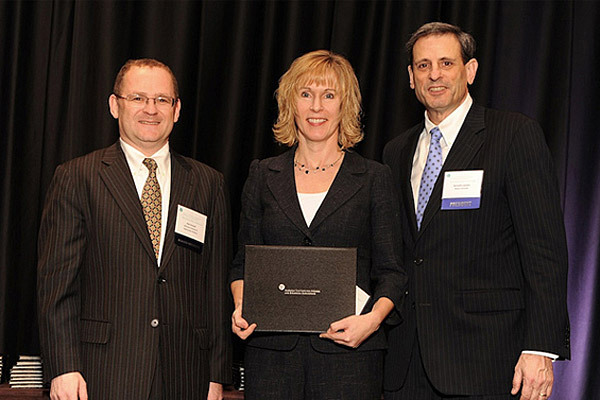 Pictured are (from left) Alan Russell, AIMBE College of Fellows Chair (2011-12), UD's Kristi Kiick and Ken Lutchen, AIMBE president (2011-12). 9:03 a.m., March 16, 2012--Kristi Kiick, deputy dean of engineering and professor of materials science and engineering and biomedical engineering at the University of Delaware, has been inducted into the American Institute for Medical and Biological Engineering (AIMBE) College of Fellows, Class of 2012. This elite appointment distinguishes Kiick among the top two percent of her peers. AIMBE College Fellows include the top 1,000 outstanding bioengineers in academia, industry and government. She was among 94 new AIMBE Fellows inducted during the AIMBE 21st annual meeting in Washington, D.C., on Feb. 20. A leader in the medical and bioengineering community, Kiick is an internationally known scholar in the area of biomaterials design, synthesis and characterization. Her work focuses on the synthesis and assembly of biologically-derived macromolecules. She has used protein engineering methods to create entirely new classes of materials of interest for tissue engineering and drug delivery. Her current work involves examining new polymeric materials that can selectively control inflammation and immune responses as well as drug-delivering hydrogels for treating cardiovascular disease. Kiick was nominated by David C. Martin, chair of the Department of Materials Science and Engineering. In his nomination letter, Martin called Kiick’s research, teaching, advising and organizational acumen rare, placing her among a select group of scientists destined to positively impact the scientific community. “Professor Kiick’s high-profile, interdisciplinary research in biomaterials has significant potential to yield new materials-based therapies in the biomedical community. In addition, her capacity to work across multiple disciplines and with disparate groups of scientists enables her to be an effective leader,” noted Martin, Karl and Renate Böer Professor of Materials Science. In addition to this recent honor, Kiick will highlight her group’s research in biomedical applications of hydrogels in a keynote address at the World Biomaterials Congress (WBC) in Chengdu, China, June 1-5. Kiick will participate in the Hybrid Biomaterials and Drug Delivery Systems Symposium, which brings together industry experts to discuss the latest research on the design, synthesis, characterization, evaluation and application of advanced hybrid systems composed from at least two distinct classes of molecules, and their applications as novel biomaterials, sensors and drug delivery systems. Kiick earned her bachelor of science degree in chemistry from the University of Delaware and her master of science degree in chemistry as a National Science Foundation predoctoral fellow from the University of Georgia. After earning her doctoral degree in polymer science and engineering from the University of Massachusetts Amherst in 2001, she returned to UD as an assistant professor of materials science and engineering and affiliated faculty member in chemical engineering. In 2011, Kiick was promoted to professor and was named deputy dean of the College of Engineering. Her previous career honors include a National Science Foundation Faculty Early Career Development Award, Arnold and Mabel Beckman Foundation Young Investigator Award, DuPont Young Professor Award, Camille and Henry Dreyfus New Faculty Award, UD’s Francis Alison Young Scholar Award and the Etter Memorial Distinguished Lectureship. She is the author of more than 75 journal articles and book chapters, and serves on the editorial advisory boards of multiple journals in macromolecular science. She has delivered over 125 invited seminars and presentations and holds 17 U.S. patents.